A Bluetooth Low Energy / Internet connected light can be used for all sorts of things. As a status indicator, it could be used to let you know when something has occured. 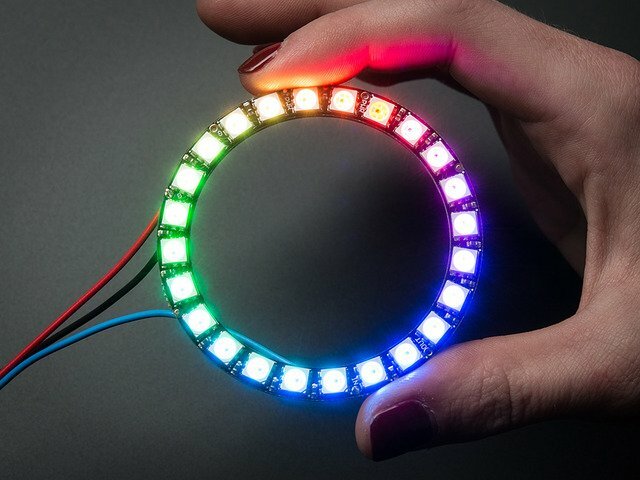 With Adafruit IO, this can combined with IFTTT( If This Then That) so the colors of the NeoPixel ring can reflect a change. It's a good idea to walk through the following guides to get familiar with the libraries, software and components. This particular sketch for the Arduino allows you to change the color of the NeoPixel LEDs and trigger animations using the Adafruit Bluefruit LE Connect app for iOS or Android. Once you get this working, you can connect the lamp to the Internet thru your phone by using our MQTT gateway capability of Bluefruit Connect - for more details check out this tutorial for details. Next, you'll need to install the Adafruit AVR boards package from the Boards Manager. Open the Boards Manager and search for Adafruit AVR. This includes all of the boards from Adafruit and will make Arduino compatabile with them. The BLE sketch was tested with version 1.4.0. All this is covered in the Bluefruit Feather tutorial guide! For this project we'll need 5 wires. Start off by measuring 8cm of length and cut 5 pieces of 26AWG wires. I recommend using Silicone-coated stranded wires. Remove about 4mm of insulation from the tips of each wire using wire strippers. Then, apply solder to the tips so they don't fray - this makes it easier to connect to the components as well. The slide switch comes with three legs, remove one of them using snips (we only need two). Trim the remaining two short (about half the length).Then, apply solder to them. Secure the switch to pair of Helping Third Hands to assist you. Get two of the five wires you made and solder them to the two legs of the slide switch. Add pieces of heat shrink tubing to insulate the exposed connections. The remaining three wires will be used to connet the 24 x NeoPixel ring to the Adafruit Feather 32u4 Bluefruit LE. Secure the NeoPixel ring PCB to a pair of Helping Third Hands. 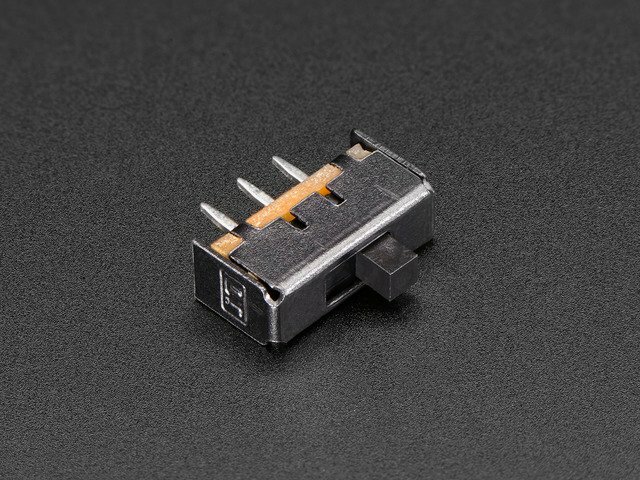 Apply solder to the Pwr 5V+, GND, GND and Data Input pins. Then, solder the three wires into them. Now our NeoPixel PCB and Slide Switch are wired up. 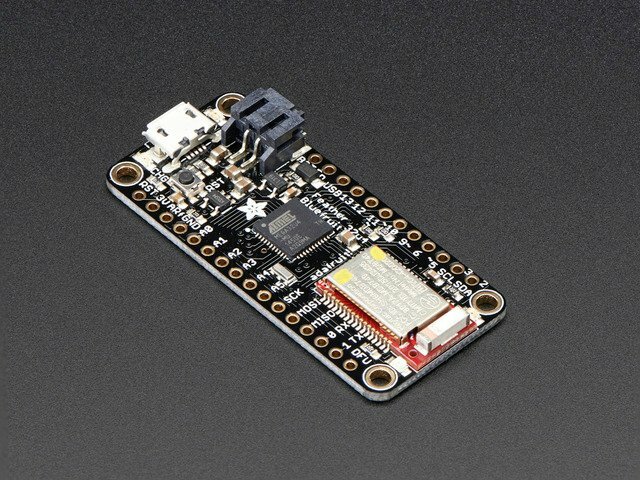 Secure the Adafruit Feather to the Helping Third Hands and apply solder to the EN, GND, 3V and #6 pins. Now we can solder up the following connections. Solder one of the two wires from the slide switch to the remaining GND pin on the NeoPixel ring. Then, solder the remaining wire from the Slide Switch to the EN pin on the Adafruit Feather. Now all of our wires and components are connected. It's a good idea to test out circuit before mounting things to the enclosure. Plug in the JST connector from the 500mAh battery into the JST port on the Adafruit Feather board. Flip the slide switch on and you should see red LED's flashing on the Adafruit Feather. Grab the two #4-40 3/8 machine screws and tap the two mounting holes near the microUSB port of the Adafruit Feather. Do this very slowly and try to fasten them in as straight as possible. Fasten the two screws until they slightly protrude the bottom of the PCB. Insert the Adafruit Feather board into the case with the microUSB port facing the cutout. Adjust the Feather board so the machine screws are seated into the holes of the two standoffs. Hold the PCB onto the case and fasten the screws so they go into the case - You only need about 3-4 turns. Don't try to fasten them all the way through or you could poke through the bottom of the case. Carefully insert the slide switch into the cutout on the opposite end of the microUSB cutout. Press it through the opening until the switch slightly sticks out the other side. The slide switch should hold in place with friction, but if you find it loose, you can use adhesives to permanently mount in place. Next up, place the 500mAh battery over the Feather board. Route the wire from the battery through the cavity and press it down so it's nested inside. Then, adjust the wires so the NeoPixel ring can sit on the circular mount. Make sure not to kink any of the wires. Lay the top part over the case and start twisting it until the threads meet and fasten the two parts together. Lay the diffuser cover over the opening of the case. Now you can press the lamp shade down top the top cover pieces. And thats it! Now you have a pretty cool looking lamp shade. If you've made one, we'd love to see and share about it on the blog! You can post a "make" on the Thingiverse project page. If you have any technical issues or questions, please post them up in the Adafruit Forums so our dedicate engineering support team can assist you. This guide was first published on Feb 18, 2016. It was last updated on Feb 18, 2016.